You may remember Joshua Smith from his work in his awesome Diablo 3 costume, well his creative juices are still flowing and he is currently in the process of creating Diablo 3 figures which are cast in black resin which will then be painted with high detail. 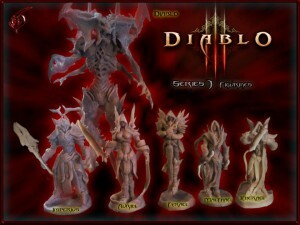 So far he has posted a shot of the figures for Diablo, Imperius, Auriel, Tyrael, Malthael and Itherael. The figures do look like they are going to be quite impressive when they are all painted up and you can also let him know what you think on Joshua’s Blog here on the site. The Lord of Terror’s weakness: He can’t look over his shoulder. Wow. Guy could get a job at Blizzard. I’d buy this merch! I feel bad for ya if you’d buy this garbage. But these figures have as much value as macaroni art. It’s CRAP, who cares. Obviously you do since you felt the need to comment. I’ll be looking forward to seeing the final painted models. Makes me wonder if DC Unlimited will be doing an action figure line for D3 like they have for SC2 and WoW. I always thought the Diablo universe had the best potential for figures in Blizz’s franchises. Yeah, it would be nice to see some official figures for the Angiris Council, D3 Diablo, D2 Diablo, the other Evils, etc. Was I the only one who thought this was going to be about money, lol.